The Queen Elizabeth Hospital (QEH) in Woolwich, London has been serving patients from the Royal Borough of Greenwich and the London Borough of Bexley since 2001. The remedial cladding work was particularly challenging for the Buckingham Coatings team. Not only was there a tight deadline to comply with the contractor’s programme but wet and cold weather conditions also had to be negotiated within the works schedule. 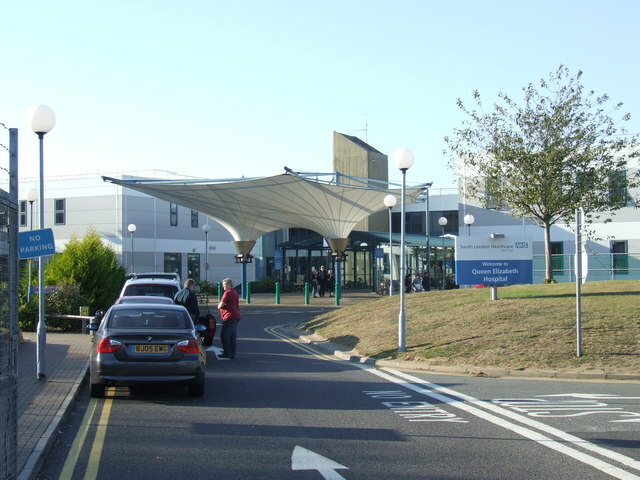 The site was an extension of the operating NHS hospital, so it was also crucial that Buckingham Coatings operatives carried out the work professionally and with minimal disruption to the hospital’s patients and staff. Several of the damaged panels were at height which made it necessary for our on-site team to use a cherry picker to access them. All Buckingham Coatings operatives hold International Powered Access Federation (IPAF) accreditations so the cladding remedial work was administered at the necessary heights safely and responsibly without any disturbance to the hospital’s day-to-day operations. It was necessary for us to use a scaffold tower for certain elements of the cladding panel repair and respray works. We were aware that extra care was necessary as some of the panels had been damaged previously through contact with a scaffold tower. However, we were able to guarantee full confidence in our operational expertise. Our operatives are fully trained on the use of this equipment and hold Prefabricated Access Suppliers’ & Manufacturers’ Association (PASMA) tickets as evidence they are fully trained. While the damaged cladding panels were being repaired, the paint was prepared for an exact colour match of the existing building’s RAL1013 oyster colour. The paint coating could then be applied to the repaired cladding panels by the on-site respray team. Despite the challenging time-frame and adverse weather conditions, our team successfully completed the cladding remedial works to meet the planned contractor schedule. The hospital extension’s cladding was suitably rescued with the necessary repair work and completed with a colour-matched paint applied to produce the high-quality coated finish to the final cladding. As testimony to QEH calling Buckingham Coatings for this job, the works were carried out with the operational professionalism and to the high standard of safety and quality that is synonymous with the Buckingham Coatings name. QEH was delighted with the final job and pleased to state that patient care was not affected by the works. Repair and Respray Cladding Panels. To refurbish several panels on multiple elevations. To mask and protect all areas unaffected by damage. Clean and prepare all deep scratches and dents for filling and priming. Fill and prime all scratches and dents. Remove excess filler and smoothen panel surface. Cherry picker required to reach works at height. Painting of panels to be completed once panels have been prepared, primed and repaired, painting technique is spraying.